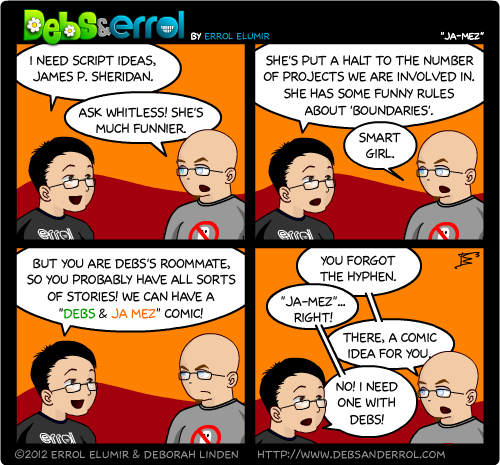 Errol: There’s been an uproar from the masses about the lack of Debs in the comics, and thus I figured I would try and cull stories from her roommates. So I contacted Ja-Mez, who happens to be one of her roommates. Considering I’m in the comics ALL THE TIME, I have no qualms about having a month’s worth of Debs & ‘whomever’ comic. This conversation was pulled from our gmail chats. Ja-Mez: I always look so grumpy, snide and disapproving. I really hope I don’t come off as one of those nerds and that Errol is just using creative license. I LOVE the disapproving look. And Errol’s return oblivious look. It’s great!!! !